Keep your work area organized with these perforated alteration tags. 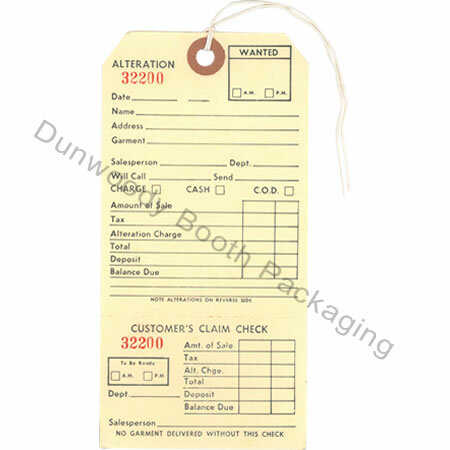 These handy tags record all the information that you will need including customer information, deposit paid, balance due, style of garment, etc. Numbered tags sent in sequence for easy record keeping. Manilla tags with reinforced hole and string. Small One Part White Tags - 1-1/4"x1-7/8"
Large One Part White Tags - 1-3/4"x2-7/8"
Coloured Two Part Tags - 1-9/16"x2-5/8"